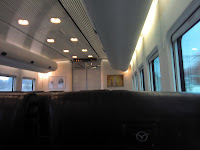 Today I took the limited express train from Hakata to Nagasaki. It had leather seats!!! The train takes about an hour and 45 minutes, with a few stops along the way. Nagasaki is, of course, famous for being the second city in Japan to have an atomic bomb dropped on it. However, there are plenty of other things to see too. Interestingly, the city is reminiscent of San Francisco, set as it is in the hills by the see. There are even antique streetcars to transport residents quickly around town! The Peace Park itself has a somewhat different atmosphere from the one in Hiroshima, which I've also visited. It's hard to put words to it, it just feels a little subtler somehow, even though the main statue in the Nagasaki park, by Seibou Kitamura, is quite bold. At the Peace Fountain, there was a couple there taking each other's pictures and I offered to take one of both of them, so they got one of me too (coming soon). The fountain is a dedication both to world peace and to the victims of the bombing who died searching for water, and is supposed to resemble the wings of the dove of peace. There are several other statues donated by sculptors around the world which are spread throughout the park. They are as moving as artifacts of the bombing, which you can see at the Nagasaki Atomic Bomb Museum. The museum, like its larger counterpart in Hiroshima, presents the events leading up to and after the bombing, as well as the history of nuclear weapons development. As the Rough Guide says, it's quite an informative place, which interestingly doesn't shy away from the fact that roughly 12,000 foreigners were killed in the blast - mostly Korean forced labourers, but also POWs from various countries. Outside the museum there is a poignant sculpture and written apology to these victims. I highly recommend a visit to both bomb sites; you can't really understand the magnitude of the impact and effects of nuclear weapons until you do. 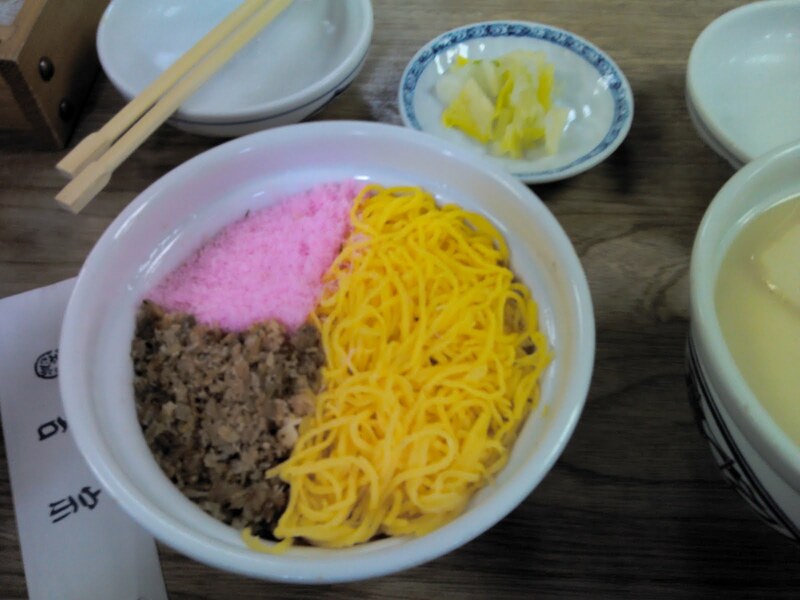 Apart from the bomb site and related sites, Nagasaki has several delicious food specialties to try, mostly related to Chinese cuisine (Nagasaki was one of the main points of contact with China in ancient times). For lunch I headed downtown for a chawanmushi set, consisting of a bowl of the chawanmushi custard, a bowl of rice with toppings, as well as pickles. Rice with toppings, pickles in background. 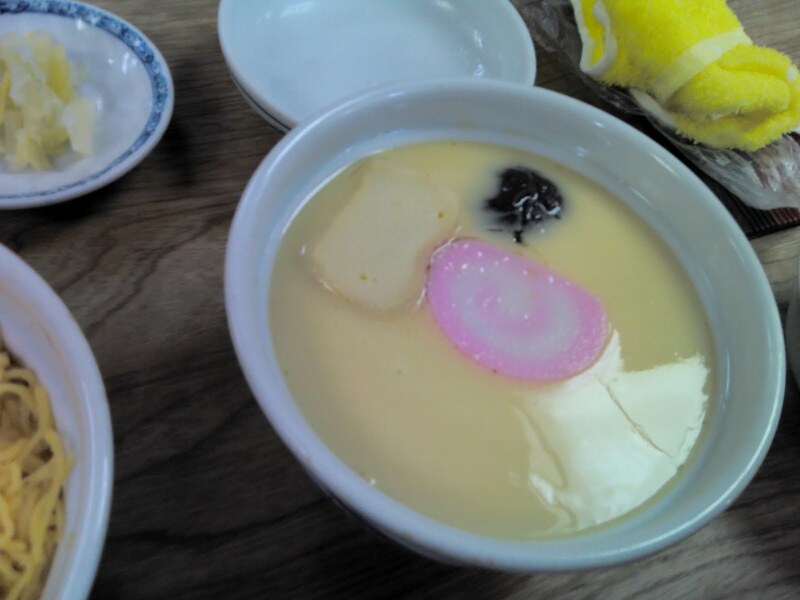 Chawanmushi custard, containing fish balls, pork, shrimp, ginko nuts, and other treats. There was yet more to see at the Nagasaki Prefectural Art Museum, a gorgeous glass cube set in the heart of Nagasaki's harbour. The special exhibit of art from children's books and stories was very nice, although I wish there had been even just a little English (or at least, hiragana/katakana and not exclusively kanji) so I could read the author's names. The main exhibit was also great, containing a Picasso and some works by Dali. There is also a free exhibit on the first floor! Again, I'm amazed at how many high-quality museums you can visit so cheaply in Japan. It wasn't that late so on my way back I hit the recreated Dutch village of Dejima. Here they have reconstructed the buildings used by the Dutch East India company for trade in Japan before it was restricted by the Tokugawa Shogunate. The museum is extensive to say the least, if a little repetitive. Still, the displays of ceramics and other artifacts of the time, as well as the recreated captain's quarters, are impressive. After that it was time to head back to Hakata. I'm sure there's much more to do in Nagasaki - I would have liked to see more of Chinatown, try champon, and visit the Glover Gardens and Dutch Slope, but there just wasn't time. It was still a good day trip from Hakata, and if you have the JR Fukuoka Rail Pass it's easy (and free) to get to by train.